The Last of Us Part 2 is going to break us emotionally, thrill us with its combat and mentally scar us with its horror, and all signs are pointing to a release date this year. Sure, so far we've only seen a glimpse of the game through some blockbuster trailers, but they promise beauty, brutality, a queer love story that will punch us right in the feels and all delivered in Naughty Dog's cinematic style. It's been more than five years since the original game introduced us to Joel, Ellie and those damn 'clickers,' so fans are desperate to know how the story continues. We have learned that The Last of Us Part 2 will focus on an older, tougher Ellie, but so far Joel is nowhere to be seen. The infected are still around, but everything Naughty Dog has shown so far has focused on a violent cult called the Seraphites, and they look like right royal pains in the behind. We've collected everything we do know, and a few rumors too, into this handy guide to all things The Last of Us Part 2. No real surprise on this one. Naughty Dog has a history of delays, and it's understandable that the studio might not want to commit to a Last of Us Part 2 release date yet. But, the internet has its theories. Just ;ast month, a retailer leak suggested that The Last of Us 2's release date would be sometime in October 2019, and now the PlayStation Store itself is supporting that launch window. As spotted by a Redditor by the name of fetemucke, the online PSN Store in the US, UK, Germany, and Italy has now listed The Last of Us 2 under its "Coming Soon" lineup of titles, the rest of which all have a confirmed release date of 2019. For comparison, other PS4 exclusives Death Stranding or Ghost of Tsushimaaren't listed within this section, but multi-platform titles like Mortal Kombat 11 and Control are. We haven't seen Joel yet, but we (probably) know he's still around, as the latest E3 gameplay demo makes explicit reference to Ellie's "old man". Still, that doesn't name Joel explicitly, so there's still a chance his presence will be a psychological one rather than a literal one. Naughty Dog does love misdirecting its audience before its big games release. Either way, judging by Druckmann’s comments, this follow-up is going to be much more closely linked to its predecessor than many other triple-A sequels. Seeing as the last game ended on such a wonderfully ambiguous, quasi-cliffhanger, we expect The Last of Us 2 to deal with the lie Joel told Ellie during that emotional epilogue. Don’t forget, the weathered Texan smuggler basically doomed humanity to extinction when he stopped the Fireflies from performing a lethal operation on Ellie that could have produced a cure for the Cordyceps Brain Infection. Sure, he saved his surrogate daughter’s life, but he also went against her wishes; damning humanity to generations of scratching out an existence against the backdrop of a zombie apocalypse. Whether or not Ellie bought Joel's lie is currently unknown, but what we do know is that she seems really, really angry - though not without humanity. In the game's first trailer, she states an intent to "Kill every last one of them" (whoever "them" might be), and the E3 2018 trailer intercuts moments of tender friendship and romance with extreme violence on a par with with the graphic horror of French New Extreme cinema. Whatever's going on, Ellie is in an interesting place. As of Sony's E3 2018 presentation, we've now, finally, had an intensive look at some The Last of Us Part 2 gameplay. And "intensive" is indeed the world. 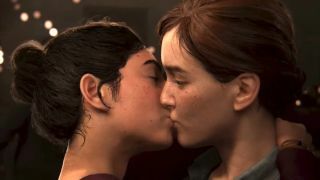 Very much taking its cues from the first game's meaty, improvisational, evasion-driven guerrilla combat, The Last of Us Part 2 looks to take a somewhat quicker, more nimble approach with Ellie as its protagonist - she can grab bottles and hurl them seamlessly at attackers without breaking a sprint, for instance, and her transitions between various types of cover and combat look a lot slicker than Joel's. That said, the level of graphic violence has clearly gone up. The Last of Us was no slouch when it came to uncomfortable gore, but the Last of Us Part 2 gameplay demo is on a whole other level. Following a tender scene of friendship and romance, we starkly cut to Ellie, knife already in a man's throat, gutting him like a fish. It only stays messy from there on out, the violence depicted as hovering somewhere between extravagantly graphic bloodletting and gritty, anatomically realistic unpleasantness. It's nasty, crunchy, choking, gurgling, and wheezing stuff throughout. Hopefully there's a reason for that. The first game was, after all, a violent game about violence, in which the unglamourous depiction of killing with repercussions formed a great deal of the point. With so little context for Ellie's actions so far, it's hard to know whether The Last of Us Part 2 is doing something clever here, or just trying to win a 'maturity' arms-race with itself. We'll probably only know for sure when we get hold of the final game. We've actually now had a few different The Last of Us Part 2 trailers, yet still, somehow, we have very little idea of what's going on. The first was an ambient piece, reintroducing Joel and Ellie while giving very little detail of the scenario. The second was a sustained, gruelling bout of violence, depicting a bunch of characters we don't know, but hinting at a far more tribalised society with at least one murderous cult in its midst. As of E3 2018 though, we have a proper, focused look at Ellie and her story, told through both cutscene and The Last of Us Part 2 gameplay. Though you probably watched it on the way to scrolling down here. No, we're still not sure what's going on either. Fans had already worked this one out pretty well, but The Last of Us Part 2 director Neil Druckmann confirmed it at PlayStation Experience 2017: a "large part" of the game will take place in Seattle. The original began in Boston then went on a journey across the United States as far west as Salt Lake City. When we last saw Joel and Ellie, they'd headed back east a ways to Jackson County in Wyoming, planning to stay at the settlement led by Joel's brother Tommy. We don't know how long that arrangement lasted, but Ellie's clearly done more traveling since then. Still, that's just a "large part". It seems unlikely that The Last of Us Part 2 will remain rooted in the Pacific Northwest after how much roving the first game did. Maybe Ellie will make her way down the coast? We don't know if things are as bad on the western seaboard in terms of infection and military oppression. But it wouldn't be much of a survival story if Ellie just traipsed down to Portland and lived happily ever after. Gross is actually a talented Jack - should that be ‘Jill’(?) of all trades - having also acted in shows as diverse as Comedy Central’s Broad City to Law & Order: Special Victims Unit. It’s not clear if Naughty Dog approached Gross following Westworld’s astronomical success, or if she’s been helping out on The Last of Us 2 for a while. Regardless, it’s super exciting to see a writer who’s penned scripts for the hottest show on the planet get involved with the story of The Last of Us 2. Whether Druckmann will take on the dual roles of both creative director and game director on The Last of Us 2 is unclear. Perhaps Naughty Dog will bring in a new director to allow Neil to concentrate fully on ensuring this sequel’s script lives up to the impeccable standards set by the original. Update: Bruce Straley has since left Naughty Dog, so he definitely won't be joining back in on the company's future projects, either. Gustavo Santaolalla is the man. Specifically, a man who is very, VERY good at writing music. The Argentine composer won back-to-back Best Original Score Oscars for his work on Brokeback Mountain and Babel, before going on to conduct The Last of Us’ masterfully melancholic soundtrack. Druckmann recently confirmed Santaolalla is returning to compose the music for the Last of Us Part 2, especially notable as it’s the first time he’s returned for a sequel. The Last of Us 2 concept art gives us a glimpse of what's in store. Ellie, what have you done? The Last of Us 2's themes might involve religion and "the choices that defined who we are"
The Last of Us 2 stars Ellie as the playable character and is a story about hate: "she's seen some sh*t"